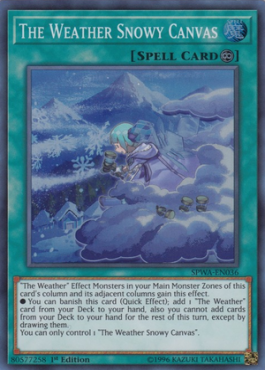 "The Weather" Effect Monsters in your Main Monster Zones of this card's column and its adjacent columns gain this effect. * You can banish this card (Quick Effect); add 1 "The Weather" card from your Deck to your hand, also you cannot add cards from your Deck to your hand for the rest of this turn, except by drawing them. You can only control 1 "The Weather Snowy Canvas".